I came across photos of this really cool boys room decorated a few years ago by their mama, and blogger of Under the Sycamore Ashley Ann. I love that she took what her three boys wanted in their room (Orange, planes, and nothing girly!) and created a unique well crafted look. What I love most is the way she added personalized art and photos to the kids room. Did you notice the ridiculously cute family portrait painting on the shelf? The painting was done by their biggest brother and is a family portrait. How adorable did it turn out?! And what a fun project to do with your children! 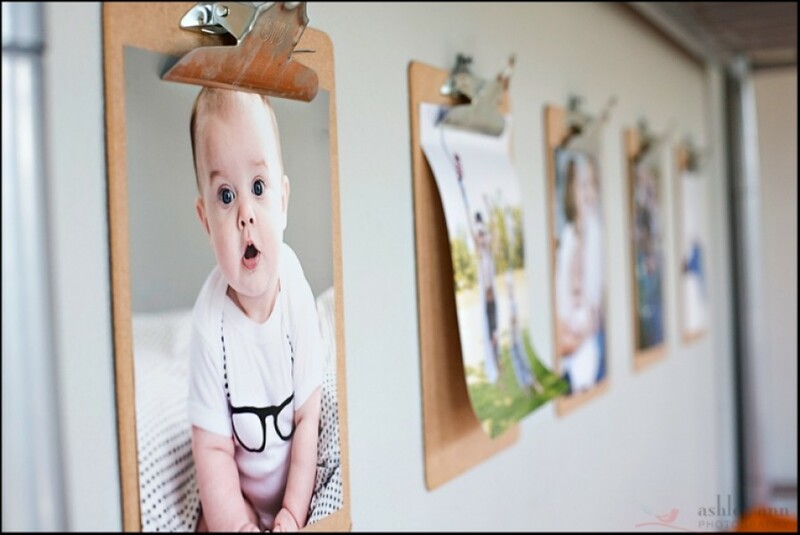 Another cute display idea is the photos on the clipboards. Big brother got to select the photos that go on these and it’s so sweet that he chose a photo of his baby sister. A very unique way to display photos or anything else that your kids love and feel is display worthy. And when your kids ask to tape their favorite cutouts to the wall, what do you do? You create a banner of course! I love the compromise on this idea. Biggest Brother wanted to tape Lego Star Wars characters on the wall so mama compromised by making a little paper banner with his cutouts and it is SO cute! I think it is so important to display artwork created by your little Picasso’s because it helps promote their creativity and the proud look on their lil faces when their own artwork is on the wall is so priceless. You can combine your kids personalized artwork with framed wall art purchased from The Land of Nod, for example, and the combination of both will be enough to fill the walls and add some whimsy to the room. Do you have any great ideas on how to add personalized artwork and photos to your kids room? Don’t keep your secrets to yourself, let me know and I’ll use in a future post!